EGA 360 degree rotating rolling ladders are the perfect solution for tight warehouse aisles. These ladders can spin on their own axis while still being able to track in a straight line. Unique 4 wheel, double Ezy-lock design. 2-1/2″ pads on each ladder leg for a secure feel in the climbing position. Rugged 1″ square tube construction with comfortable 1″ round tube handrails. A dynamic ladder that pivots on a 360-degree axis is a great option when a serious access height is needed, but tight corridors challenge mobility. 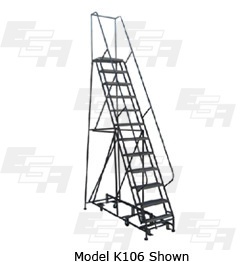 The boost to maneuverability makes an otherwise claustrophobic warehouse very workable, and the American built quality makes the ladder very dependable. Available in 60-degree incline angle for a more compact footprint or ezy-angle 50-degree incline. Meets OSHA standards. Weight capacity is 450 lbs. Grip Strut is a patented technology that Grips soles securely — in all directions — and features a high strength-to-weight performance that’s achieved through detailed structural design.Grip Strut features a maintenance-free, open design. This patented technology makes for quick drainage of fluids, chips, grease, and mud. Any ice buildup is easily vanquished under normal foot pressure. The open design creates convenient access for cleaning with a brush, liquid, or spray. That said, the Grip Strut openings are small enough to catch most falling tools and other dangerous objects.